Astrology, the study of the stars, is one of the oldest known sciences and is one of the main components of the knowledge studied by the Golden Dawn and other esoteric traditions. Ceremonial magicians of all stripes are known for utilizing a large amount of astrological information in ritual work, divination, talisman consecrations, pathworkings, and meditations. In the Outer Order of the Golden Dawn the student learns basic astrological information concerning the zodiacal wheel, the twelve signs, the twelve houses, the decanates, the triplicities, the quadruplicities, and the aspects, etc. All of this knowledge is later used for elemental, planetary, and zodiacal magic in the higher grades of the Inner Order. Numerous lists of astrological correspondences and planetary hours dating from Medieval source books are regularly consulted in the ritual work of the R. R. et A. C. The creation of astrological talismans and implements is a common practice in the Adept grades. Next to the teachings of the qabalah, astrological correspondences form the most prevalent portion of esoteric knowledge used in both the Outer and Inner Orders. "Since antiquity, ritualists have included astrological concepts into their work and worldviews, often giving them a central place--even if they were not actually taking clients or reading charts. Likewise, although astrologers could easily take clients as their day job while experiencing spirituality only at the church or synagogue or mosque, an astrologer with the right books or connections could easily gain personal enrichment involving astrological magic, planetary angels, and so on. But things began to change during the Copernican Revolution, when astrological reformers were often busy trying to make astrology more 'scientific,' and distinguished themselves from ritual practitioners. [...] But mainstream astrologers really missed out, probably in part due to modern dissatisfactions with organized religion and its hostility to astrology. [...] (F)or many decades now, modern astrology has often had to adopt non-astrological approaches to spirituality, and graft them onto astrology." The Introduction to the text is a comprehensive and erudite explanation of the authors' approach to astrological magic. The bulk of the book contains rituals and meditative work for elemental, planetary, and zodiacal rites. Part One provides elemental consecrations of salt (earth), a vial (water), incense (air) and a candle (fire). The elemental rituals culminate in a Spirit working which utilizes all the elements. Part Two presents seven planetary rituals for consecrating planetary candles, followed by a culminating ritual which utilizes all seven planets. Part Three includes twelve invocations of the zodiacal signs followed by an invocation of the triplicities of the zodiac. Appendices provide further tables and lists of astrological information in addition to correspondences of incenses and color. 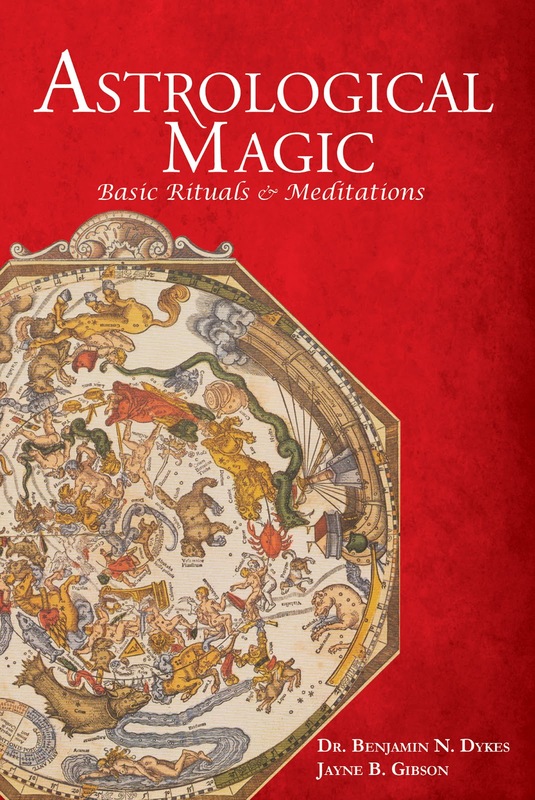 Astrological Magic is a book designed to bring the spiritual benefits of magic, ritual, and devotional practice back to modern-day astrologers. But it is also designed to reconnect ritualists with the principles of chart construction through understanding elections (choosing auspicious astrological times to begin something). The authors of Astrological Magic: Basic Rituals and Meditations are well suited to this task: Dr. Dykes is a leading medieval astrologer and translator, while Ms. Gibson is a talented ritualist and Golden Dawn practitioner. Yet this book was not written exclusively for magicians and astrologers--it was also designed to be used by practitioners of various spiritual paths. The authors present astrological magic as a preeminent form of ritualized healing and personal balancing on all levels, and they do so with language that is easily understood. This is a book meant for "doers" more than "browsers. " It should be read for its knowledge and experienced for its practical workings and benefits. A must have for anyone interested in magic and astrology. by Dr. Benjamin N. Dykes and Jayne B. Gibson.